WHM/cPanel is the most popular web hosting control panel for Linux operating systems. Using WHM/cPanel we can easily manage our web hosting environment without having more technical skills. If you have basic knowledge of hosting with networking you can manage any web hosting server using WHM/cPanel. WHM/cPanel is basically divided into two parts WHM and cPanel. WHM section is used for managing your system, hosting accounts and maintenance of system where cPanel is known as single hosting account. This article will help you to install cPanel and WHM on CentOS/RHEL and CloudLinux operating systems. For more details visit WHM/cPanel system requirements url. Before installing WHM/cPanel on your system, make sure to set a proper fully qualified hostname for your system. Now edit /etc/hosts to point hostname to local system ip. For example local system ip is 192.168.1.100, Do the following entry in /etc/hosts file. Now make sure to disable selinux on your system before starting cPanel and WHM installation. To disable selinux execute following command. Now edit /etc/sysconfig/selinux and update following entry for disabling SELinux permanently. Your installation preparation has been completed for WHM/cPanel. 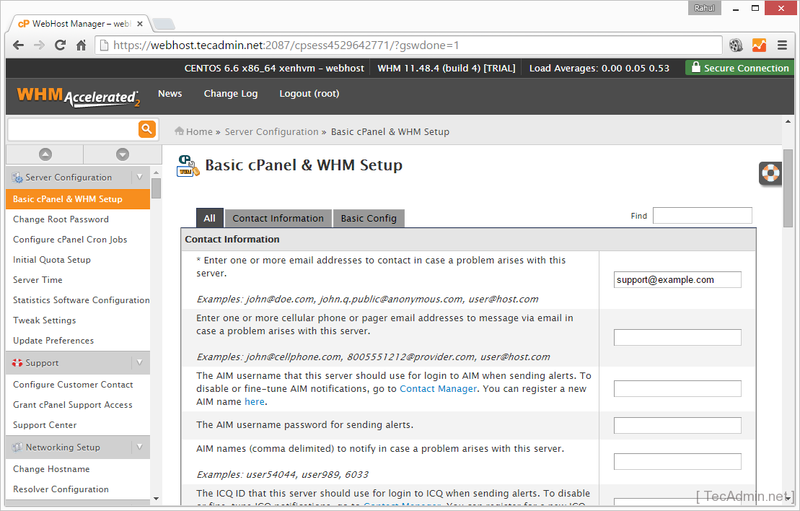 Now execute one by one following commands to install WHM/cPanel on your system. Installation processes will take more time (Approx 1 hour or more) as per your network speed and operating system speed. After completing installation your will get output like below. 2015-05-28 12:23:48  183 ( INFO): cPanel install finished in 66 minutes and 9 seconds! 2015-05-28 12:23:48  684 ( INFO): Congratulations! Your installation of cPanel & WHM 11.48 is now complete. The next step is to configure your server. 2015-05-28 12:23:48  684 ( INFO): Before you configure your server, ensure that your firewall allows access on port 2087. 2015-05-28 12:23:48  684 ( INFO): On RHEL, CentOS, and CloudLinux systems, execute /scripts/configure_firewall_for_cpanel to accomplish this. 2015-05-28 12:23:48  684 ( INFO): After ensuring that your firewall allows access on port 2087, you can configure your server. 2015-05-28 12:23:48  684 ( INFO): Visit http://go.cpanel.net/whminit for more information about first-time configuration of your server. 2015-05-28 12:23:48  684 ( INFO): Thank you for installing cPanel & WHM 11.48! After completing WHM/cPanel installation on your system successfully you can access WHM on 2086 & 2087(with ssl) and cPanel accounts on 2082 & 2083(with ssl) ports. Now login to your WHM account and completed post installation instructions ans per your required configuration. You can access WHM using root account and their password at following urls. Login with your root account credentials and complete following six steps. As the WHM/cPanel is available with commercial license, So you need to purchase a license (based on ip) from cPanel or its third-party sites. When you purchased a commercial license for your cPanel server activate is using following command. To verify your license visit cPanel license verification url and enter public ip your server. Thanks Brother. Cpanel and WHM installation in CentOS is very easy. The installation process you have shown for CentOS. How to install in RHEL -7 ? ?